There is a distinct back-to-school vibe in Edinburgh this weekend. For the past month, the Edinburgh Fringe Festival has dominated the town but on Monday night it all officially ends and the mass exodus of hard-shell suitcases towards Waverley station has already begun. More than one local has lamented that, while the city is overstuffed with people right now, it always feels so quiet and empty for that first week after festival. All those fleeting “Fringe friendships” and the abandon of the summer festivities come to an end, the venues are torn down and the town goes back to business as usual. The first days of festival seem so long ago now. I remember looking at the Fringe guide – a phonebook-sized thing containing thousands of shows – and wondering how on earth we were going to decide what to go and see. The whole thing was overwhelming. But now that I’ve finally figured out a few things about how it all works, I wish I could go back to the beginning and see everything we’ve missed out on. We were such newbies back then that we didn’t even know there WAS a festival happening until we decided to come to Edinburgh for a month in August – we just figured it would be the best time to visit weather-wise. 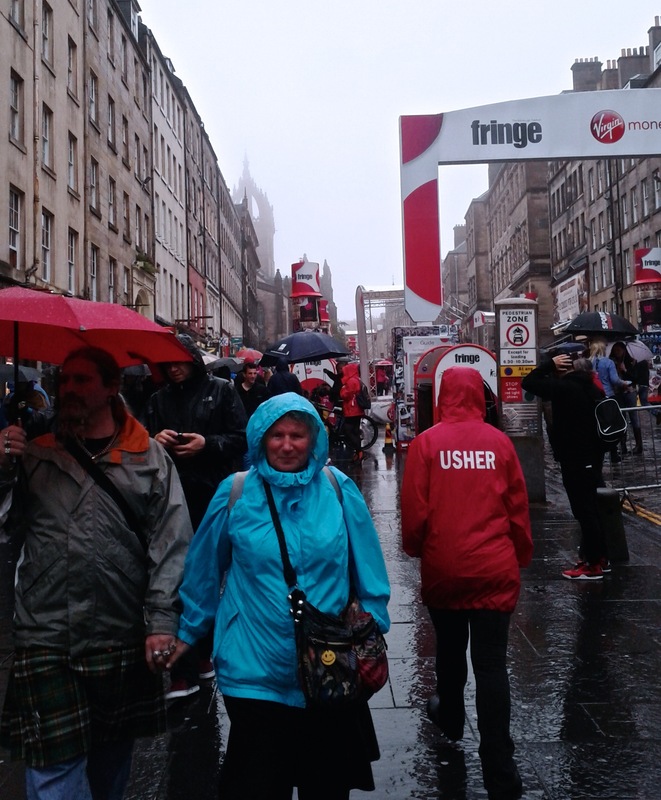 August in Edinburgh – not the weather we were hoping for! Well we were wrong about the weather (oh so wrong!) but it’s been a fantastic month anyway.We’ve laughed at almost everything conceivable – from hip hip improv to shitting the bed – but also been educated, entertained and surprised in equal measure. The Fringe has been an all-round fun and eye-opening experience, which is just as well because if you’re in Edinburgh in August it’s pretty much impossible to avoid it. Fireworks go off nightly. 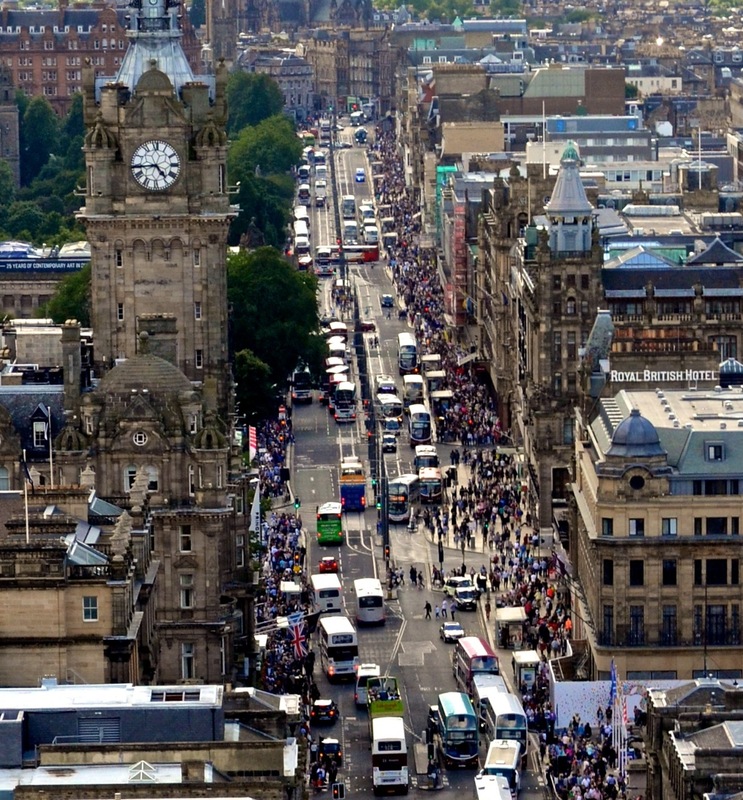 The main streets are swarming with tourists, street performers and Fringe workers. Venues of all kinds pop up all around town and not just in bars and comedy clubs. Any available floor space has been repurposed as a venue – lecture halls, churches, yoga studios and scores of tiny dark spaces that I can only imagine are usually potato storerooms. 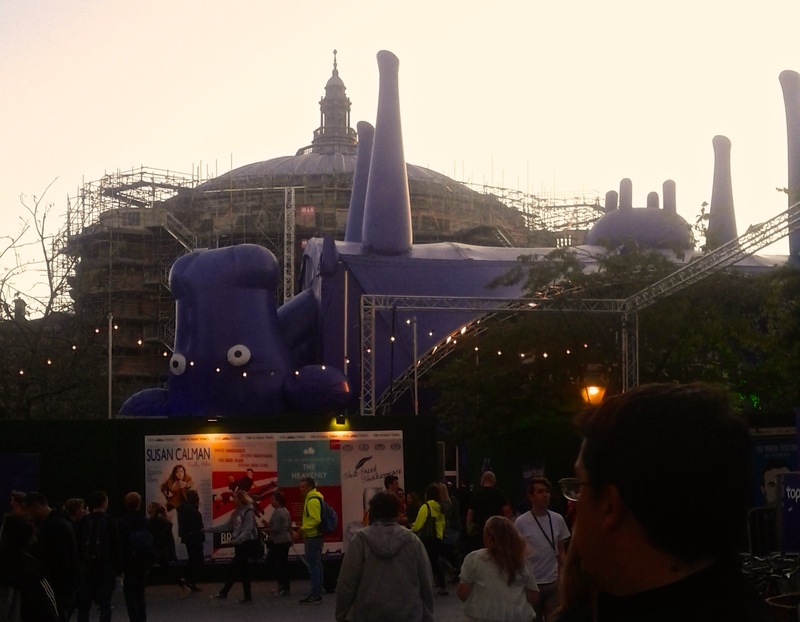 Some are specially constructed just for the festival – it’s pretty hard not to notice a tent shaped like a giant upturned purple cow, let alone resist the urge to go and see a show inside it. Yes, it’s a purple cow. Just opening our front door every day would put us face-to-face with an almost life-sized cardboard Frank Skinner that had been attached to the the building’s gatepost. I felt a little bit sad when he was abruptly removed last weekend. Almost every conversation with anybody (your friends, your coworkers, your waiter, your hairdresser) inevitably contains the phrase “Have you seen anything good recently?” Understandable, really, because you could either read through and decide between 3,193 show blurbs in the guide or be lazy and just trust to word on the street. And then there’s the flyerers. Walk in the city for half an hour and you’ll be weighed down with another phonebook’s worth of flyers. We may be enjoying the Fringe but our forests are most definitely not. In the eager early days I was zig zagging the pavements picking up every single one. These last two weeks we’ve been employing SEAL-like tactics just to avoid having to decline a flyer. Except for that flyer that comes with a stick of candy – I’ve got three of those. But while the Fringe-goers and journalists are lamenting the end of festival, I’m getting the impression the performers are starting to see the light at the end of a rollercoaster-shaped tunnel. It may be back to school for us but it’s the last days of term for them and they’ve thrown caution to the wind. Nowadays, every time a comedian gets less than 100% of the audience to laugh at a joke you can practically see them thinking ahh f*ck you all, it’s too late to win best joke anyway and soon I’m going to be getting pissed in Magaluf. Incidentally, Magaluf girl has gotten a lot of lip service at the festival. She’ll be happy to know that rather than poking fun at her, the comedians have collectively taken her side. Why shouldn’t Magaluf girl be free to express herself they say, making me wonder if the subtext is she did that for a drink, I’ve done worse just to get a laugh. There are some upsides to the end of festival though. I think many would agree that Mark Monahan nailed it when he described the experience as a “Ponzi scheme of hangovers, each one carefully layered over the other”. Laughter definitely flows more easily from a lubricated gullet so you always feel you’d be doing the performers a disservice if you didn’t partake in a couple of glasses of overpriced booze before the show. Especially if the show is Sh*t-Faced Shakespeare (solidarity and all that). I’m hoping being able to walk beyond crawling pace on North Bridge will be another upside. 1. With the exception of Tom Allen, the dress code for British comedians is “eating a TV dinner alone in bed”. 4. Never leave the house without a rain-repelling device. Never. Just don’t do it. Unless you want to get wet or end up having to panic-buy one of those Scottish-flag ponchos from the tourist shop, which is a dangerous because many groups use them to identify their members in the crowd so you may look behind you to find a string of Japanese tourists following you. 5. The “Freestival” shows aren’t actually free, they’re “pay what you like”. In reality that means you sometimes pay more than you would normally because the comedian is blocking the exit with a jar and an imploring “Daddy doesn’t support my comedy career” look. However, they’re often well worth it and not having to buy tickets keeps things spontaneous. Just make sure you don’t get caught out without any cash on you unless you’ve perfected your “Daddy doesn’t support my comedy habit” look. ← Travel Hack – Chocolate when it’s hot!